Joseph Ellicott, land agent for the Holland Land Co.
One of the radials of the 1804 plan was the street, later named Genesee St. The Holland Land Purchase was an area of land In Western New York State comprising most of the present counties of:Niagara, Genesee, Erie, Wyoming, Orleans. Chautauqua. Allegany and Cattaraugus. It was first opened to settlement late in the year 1800. Joseph Ellicott,, the chief of the surveying team and the agent for land sales, had surveyed part of the northern region and had had a rough road cleared from the great bend of the Tonnewanda Creek (Batavia) to the mouth of Buffalo Creek, following an Indian path along the crest of the Onondaga escarpment for most of that distance. Prior to 1801 there were only a half dozen houses at Buffalo Creek. They were inhabited by adventurers and Indian traders. A sliver-smith who had been making ornaments for trade with the Indians was induced by Ellicott to build a tavern for the accommodation of travelers on the new road. About fifteen miles east of Buffalo Creek, Asa Ransom built a two story log house in a gap in the escarpment, later named Clarence Hollow. In 1801 Joseph Ellicott located his first land office in Ransom's tavern in hope of Intercepting travelers, Pennsylvania Germans headed for the crossing to Canada and New Englanders heading west to the Connecticut Reserve of Ohio, and persuading them to settle in Western New York. 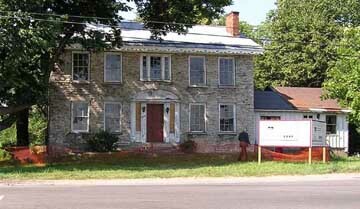 In 1802 Ellicott moved the land office to a similar large log building at Batavia. That year the County of Genesee was created including most of the Holland Land Company's territory. Few settlers were able to purchase land outright. - they would instead "take an article" which meant making a small downpayment and signing a contract to work at clearing and improving the land. Often a settler was not able to meet the terms of the "article" and the Holland Land Company would "re-article" the partially improved land to someone else. The length of many of the contracts was ten years. Thus many successful settlers had been on the land with buildings built and lived-in years before they ever received a deed to the property. Other settlers who cleared land and built buildings never obtained a deed. Clarence: In the town of Clarence, which included the later Town of Lancaster, there were large natural "openings" In the native forests, south of the Onondaga escarpment. These were the lots taken up earliest since they were already partially cleared of trees. Buffalo: Scattered families took up lots along Main Street, the widened Indian trail, into the Village of Buffalo Creek. No lots were let in that village until 1804. 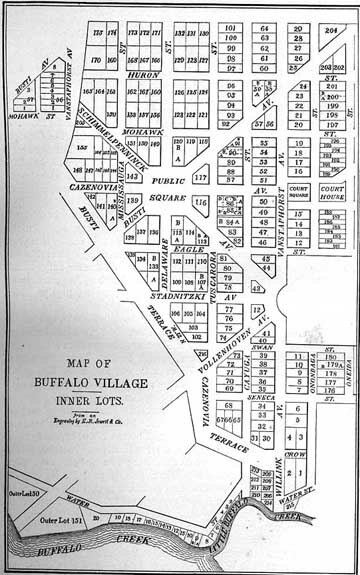 The very first deed in the future city of Buffalo was Lot 30, August 1804, to Wm. .Johnston for the lot on the corner of Main Street and The Terrace which then contained Asa Ransom's first small log cabin and later was the site of Gillet's Coffee House. Clarence: The first settlers in the area of Clarence that later became the Town of Lancaster were Amos and James Woodward who in November of 1803 took an article for Lot 6. Section 12, of Town 11 in Range 6. They built a small yankee log cabin on that lot that has survived known as the Gipple Cabin, the oldest building still standing In Erie County. That same month of 1803 Alanson Eggleston took an article for Lot 4 of Section 6. The lots were 1/4 mile wide and 3/4 mile deep. One year later Warren Hull would take an article to the lot adjacent to Eggleston's on the west. The Buffalo Road between Batavia and the Village at the mouth of Buffalo Creek was notoriously difficult. Its condition in 1804 is documented in two travelers' accounts, that of the Rev. Timothy Dwight, President of Yale College, and the Irish poet Thomas Moore who commented on "the very dreary wilderness between Batavia and . . . Buffalo on Lake Erie." A better road was needed. In "The Developer's Frontier: The Making of the Western New York Landscape," William Wyckoff describes how Joseph Ellicott used the opening of new roads to induce settlement in areas that were out of direct communication with supplies and services. 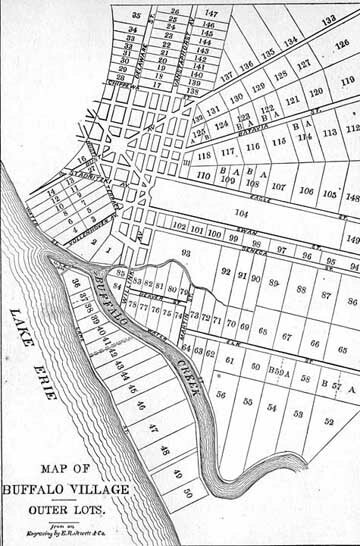 The land to which Warren Hull and his cousin Joel Parmalee took articles was on the north side of the proposed "major new east-west road that paralleled but ran south of the existing Buffalo Road." The road,. although begun in 1805, was not completed through to Batavia until 1808. In 1804 a map of all the lands owned by the Holland Land Co., was published by Joseph and Benjamin Ellicott, showing the Town grid and the established "wagon roads." The Buffalo Road is shown but not the Batavia Road. In order to induce settlers to come into western New York an anonymous pamphlet called "The Genesee Country" was published in Maryland touting the fertile lands and opportunities for settlement of the whole area west of the Genesee. Warren Hull and his family were at that time already in the Genesee Country, in Livingston County. 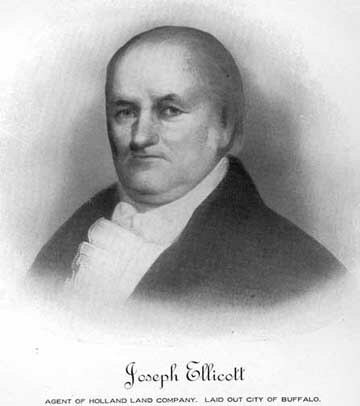 However Joseph Ellicott mounted an advertising campaign in 1803 and 1804, investing company money in newspaper ads, handbills and maps, promoting settlement in the company's lands. According to Wykoff "Ellicott's most ambitious single advertising effort occurred in the fall of 1803. In September, Ellicott employed a Canandaigua printer to produce six hundred handbills." Perhaps Warren Hull responded to this campaign, for although the majority of the first settlers Into this area were "Yankees" the statistics indicate that they were already settled In New York State, west of the Mohawk Valley. Only a small percentage of settlers before 1808 came directly from New England.